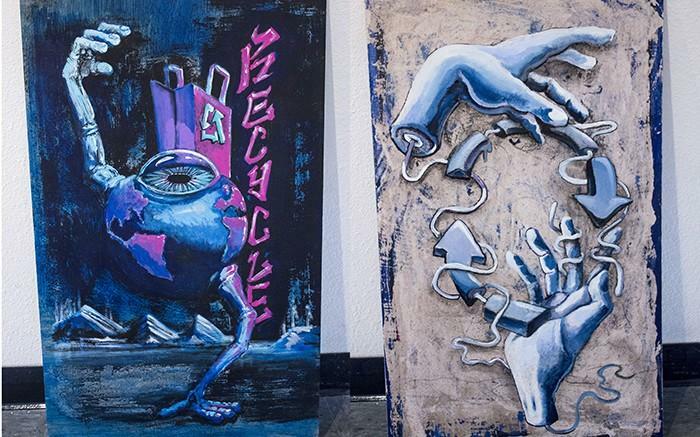 The Earth painted in shades of blue and pink featuring a large eyeball is one of the artworks that will be displayed on trash bins that will be “upcycled” into recycling bins on the American River campus in coming weeks. “I asked myself what does it mean to recycle and I realized it was a subliminal thought — Earth is watching you,” Putnam said. Art professor Mick Sheldon asked Putnam to participate in the project. “The most challenging part of the process was bridging the gap — seeing the piece for what is was at the time and not what I wanted it to be,” said Putnam. With the help of various groups on campus including the administration, the Associated Student Body Student Senate, the art department and maintenance, the American River Sustainability program has created a project to “upcycle” select trash bins around the school into recycling bins that are decorated with student art. Don Reid is directing the project. Reid, who also works as the sustainability representative for the Building, Grounds and Safety Committee, was approached by the Student Senate last spring about how to best spend money on campus. “The first thing that came to mind was recycling,” Reid said. Reid went on to point out that if one were to walk from the administration building to the Student Center, they would find many trash bins but very few recycling bins. After Student Senate approved funding for the project and administration matched the board’s funds, Reid went to art professor Mick Sheldon and asked if some of his students would be interested in designing art for the upcycled bins. The requirements for the art are that it has to be in shades of blue and incorporate some kind of symbol for recycling to allow the average person on campus to understand that it is a recycling bin. Max Marchol, a studio art major, was approached by Sheldon to paint an image for one of the bins. The first-semester student came up with a design of a tree growing on top of squares that are falling away from underneath it. According to Marchol, the idea was that the squares are discarded, man-made objects free from consuming, which will eventually allow life to grow. Marchol said that coming up with an idea for the project did not take long. “I always have ideas bouncing around in my head. I take an existing idea and adapt it to my cause and find expression there,” Marchol said. It is hoped that four bins are completed by the end of the semester. In total, 15 bins have been set aside for the project. Be the first to comment on "ARC to decorate recycling bins with student art"